I doodle during meetings at work in order to keep my mind from wandering. But sometimes my mind wanders into even weirder territory when the doodles begin to take shape. I still pay attention to the meeting, which explains some of the incoherence of the resulting doodles (i.e. see the inexplicable lower portion of a saw in the upper left quadrant of the frame). 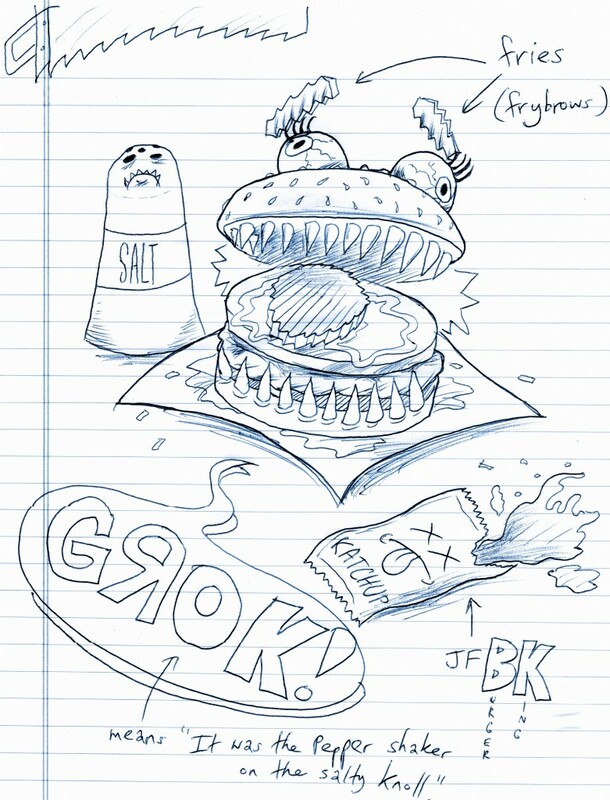 I hereby dub today’s doodle “The Assassination of JF(Burger)K(ing).” Medium: Pen with notebook paper. Transferred to computer via Epson Stylus NX125 scanner. I was always fascinated by the assassination of JFK as a child. I felt so sad for Jackie. I often fantasized about traveling back in time to save JFK. I never once imagined him to be a slain packet of “KATCHUP” (sic). I’m proud of the “frybrows.” Not a bad portmanteau for a meeting doodle. The pickle tongue on the hamburger has probably been done before, but I remain fond of it. The salt shaker is especially sinister looking, and I’m not entirely sure why. Sometimes it’s better not to ask questions.